Songwriting, Music making, producing, performing articles to boost your career in music with The Serious Writers Guild at Makehits: “String Sections recording with a synth? HOW?" “String Section recording with a synth? HOW?" String writing and string recording can be a dark mystery...just how is it done? Strings can sound awesome and really add to an arrangement or just make it sound downright amateur....how do the 'pros' do it? Is it a cosy little studio with six fiddles squeezed in and the engineer using every trick of Hit Recording to make them sound like twenty? How many strings are there in the room? Once you have got the general idea in your brain [it will be different for each track] then you have to PLAN how you are going to do it. For instance, I love a bouncy dance track where there is a chill out section in the middle and suddenly a huge mellow string orchestra plays for eight bars...did it last night ...what an effect...but takes a lot of planning and a lot of playing. A dance track or a modern day POP track may just have a single line of violins...or at most, violins and violas playing in octaves...this is usually because the producer/programmer/arranger hasn't a clue about proper strings...so, you have to be aware that sometimes YOU have to think that way...I have to force myself sometime to be simplistic and not clutter up the frequencies...maybe that is why your strings 'take over', do they? Also, in this style of string arranging you have to be desperately careful that the strings are in a frequency where they will be 'heard'...and that is not a lot to do with volume; it is strictly to do with the frequency range..in other words where they are playing ...are they in the vocal frequency? guitar frequency? piano frequency? You really have to examine the writing of the strings and make sure they are playing in a frequency where no one else is playing...this way they will be heard. Next, you have to make sure they are only playing when they should! In other words, again, they should only play in 'the cracks' between the vocal lines...a huge mistake which amateur arrangers make is to have everything playing at once..then they wonder why the track is stodgy and you can't hear a defined vocal...so beware!...Sibelius: "music is the silence between the notes". Check out DJ Dean: 'The Launch'...I have Members of my 'Serious Writers Guild' quiz me about a synth sound that is that size....the reason why it is that size is that there is nothing else playing! Simple! Also remember that the lower and longer the string notes, the stodgier the track will become...that is why most dance tracks use sparse, very high strings....Donna Summer started that trend and it is still valid today. So to bounce? Make 'em short, high and sparse. If you use a full section of strings then you have to have the TOON to take it...say a Robbie Williams track or a Radiohead or in the extreme a Michael Watson track. With my 'Bachelors' stuff I do this a lot...makes it all sound very 'expensive'...particularly when you add harp/harp glisses/belltree...this definitely adds gloss and indefinable 'quality'. For a huge section you have to think and plan.....you MUST use a touch sensitive keyboard. And NEVER use the compression/limiting facility on the computer...it brings all notes to the same level...kills the natural feel...again, be careful of compression and limiting when mixing strings...let them make it exciting not flatten out the emotion. You will be limited by the polyphony of the various modules...and also by the 'sound' of the modules. Don't even think about the 'big sound' if you only use one sound module or keyboard....you will be deeply disappointed! It all boils down to the theory [which no one can fathom out] that when all your sound comes out of just left/right on a module, then the resulting sound is tiny in the extreme..it's as if all those sounds are fighting to get out of just two small holes. Most guys like me prefer the tried and tested modules for 'real sounds', like strings, trumpets etc. The modern day synth based string sounds etc. are just fake sounding. Probably the best string sounds will be from the ancient Roland U110...an industry standard for all real sounds...I use two. That gives me 32 polyphony out of each.... The original AKAI sound library strings are edgy and have lots of resin [bow noise]. Very realistic. There are many great string samples available from reputable sample dealers...I use 'Natural Strings' from Metra Sound ....German, I believe...a lot of good sample stuff from Germany. So you see, already I have three different lots of 'real' strings. I now picture the orchestra in my 'imaginary' studio as we discussed above...the leader will be sitting immediately in front of the conductor...so I will use a 'solo' violin sample just for him....if you listen to a string orchestra carefully enough, you will pick out the 'timbre' of the leader's violin within the 1st violin section...in the Sixties, a leader called Charlie Katz was on hundreds of hit records...you could pick out his slow vibrato on any record. So, I get that solo violin from a plug-in card in my U110. Next, I get the 1st violin section from the U110 [String Section 2 is a stunning sound patch]. In the orchestra, two fiddle players will share each desk [so one can turn the pages]...classical orchestra people will refer to the number of desks rather than the number of violins. So we may have six desks of 1st Violin...then six desks of Violin TWO.....the U110 will still have enough timbrality to handle this...so now we have Violins 1 and 2. This is a pro programming trick....I always make a copy of each string line on the computer..then I merge the two...that gives me two images of each violin line...they won't phase [don't know why...any other instrument would].....but watch when they play in unison with another line...they can jump in 'loudness'...again don't know why...but you will have to go back over the writing and check for jumps in loudness.. this will always be due to that problem....it's worth checking. I will pan that whole 1st and 2nd section to full left round to about two 'clock on the right pan pot....then, I will turn on one of the other modules [usually my Akai S2000...very user-unfriendly bit of kit but massively powerful]....I ascribe the same midi to that module and pan the opposite to the first module so that there is a slight overlap in the middle. It is essential, before we go any further, to understand that you MUST have a dedicated reverb unit with stunning accurate predelay that you can 'time' to the BPM of the track....divide the BPM into 60 [secs] that will give you the fraction of a second per beat...then add two zeros and you get the milliseconds...then, use that figure or quarters or halves to get the required effect....you will IMMEDIATELY notice the difference in 'jump'. So, a dedicated reverb unit for each module....Zoom units are excellent for this purpose ...very clean and very accurate....and extremely reasonably priced. Much misunderstood and NEVER written properly...it would take a book to explain the logic of viola writing...I have studied it in depth with great success...the violas add the 'class' to the string section. VIOLAS ARE NOT A VIOLIN SAMPLE PLAYED DOWN AN OCTAVE. You must get a dedicated viola sample. Then you must study the writing of Viola lines...generally 1st and 2nd and playing extremely closely together half note, one note two notes apart...sounds weird on it's own but in the total section sounds wonderful. I will have another dedicated module for the violas...and use one of the violin reverb units [or the two] for this. Choose a different midi number yet again...and a proper cello sample.... OK, I have the luxury of other samplers...but they are not expensive when bought 'properly'. Cellos are always written wrong! You will see in there a lot of empty space...but the sound will be huge. A logic which is much misunderstood.....amateurs will always try to change the sound of a sample...forgetting that a dedicated research and development guy spent six months of hard work getting that sample to sound PERFECT. I know - I've been that amateur frigging about with Simmons cymbals for hours only to arrive back where I started. Samples rarely need EQ unless to adjust the frequency fractionally for 'space within a track'. So - if the violin sounds wrong...it is wrong...change the sample!....and bin the dud one! "The 'Monster' man, the greatest agent in the world - Eric Hall, at the Dusty Springfield memorial tribute with Dec and Sandy - then the man himself with Dec!" And always remember the power in using that expensive sounding section for just 8 or 16 bars...stunning! Of course, the string orchestra sounds at it's best on it's own....now that is sheer class...takes a lot of guts...but my Goodness, does it work? A classy trick, used since music was invented, is to have a 'live' instrument...voices, el. guitar maybe, or French Horn, play in unison with the lead violin...now there is a sound! Typical Question from Members of my 'Serious Writers Guild': "From your experience what is the most common mistake we are likely to make initially?" The biggest mistake is just extracting from my writings what you want to hear...and preferring to not listen to the 'whole story'....the 'whole story' works...only using the parts which suit you will only improve the parts you want improved and not the WHOLE. As regards being successful and famous and most of all RICH? Most common mistakes are: not improving looks, image...and MOST PARTICULARLY accent and overall demeanor...which is the most important bit in music. As regards recording and music? Not listening to and dissecting the charts each week and striving to create better than the Top Three. Believing the adverts and straying from 'Industry Standard'. Being sucked down the PC VST route...strictly amateur! Not using enough modules [I use 10 minimum, in a mix] and not using enough effects units [I would use 13 in my current mixes]...and mostly, not understanding the necessity to use as many compressors as you can lay your hands on. You just have to DO IT! "The Music is the Easy Bit"
Quickly - on the subject of 'string lines'. Good string writing tends to be the same as good accapella writing...the arrangement stands up on it's own without accompaniment and is an entity unto itself. A common mistake is to have ALL the strings playing at the same time....we only do that on rare occasions and usually when each 'section' has made a statement and all play the end of an 8 bar or 16 bar phrase. Amateurs just play handfuls of chords and feel this is string arranging...not a bit. And NEVER play the dreaded 'string pad'...it has no part in proper POP arranging. Typically, the two first desks would make an entry, followed by the violas a couple of bars later, in a contrapuntal sense, and then the cellos .... Wurlitzer organ players took a lot of their technique from string arrangements. So, let each section 'speak' for itself and then, like an army, when you need power for the assault, let all the sections join together. AND ALWAYS BE AWARE THAT THE MOST POWERFUL SOUND IN A STRING ORCHESTRA IS UNISON/OCTAVES. Listen to the last note of any major classical piece...what do you hear? UNISON. I invite some of the more serious Members of my 'Serious Writers Guild' to have 3 days in my studio......only Members...so don't even ask! "I read your web page about synth string arrangements.... Just one thing I wanted to confirm that I'm not to sure about. When you say record the 1st section of violins (six desks = twelve violins) do you mean twelve different violin sounds? Or do u mean use the same sound and record it twelve times? Does that also apply to the cello, viola, contrabass.....? Elliot (Serious Writers Guild Member)"
It is important to visualise the set up of a symphony orchestra. 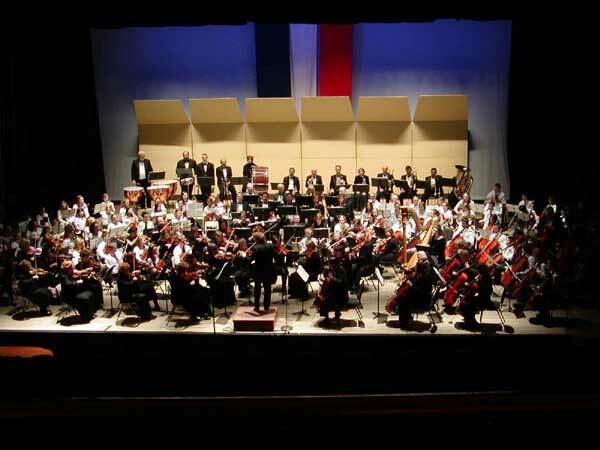 Just go to Google [images] and look for a good picture of a symphony orchestra...print it large and pin it in front of you when designing and writing strings. See the attachment...you can have mine! You will see that the desks of 1st strings are on the left [looking at the orchestra]. The leader will sit at the front desk. There will be two violin players per desk [one is designated to turn the music pages]. Beside those will be the 2nd violin desks....similarly with two per desk. The 1st violas are usually in the middle [violas look like large violins]. Two per desk. 2nd Violas beside them. The Cellos will be to the right...one per desk. Usually they all play the same line but can play harmony, which is written. Fifths and tenths are normal. A string synth or string sample sound will generally be of a string section. Say twelve violins playing the same note. The old Roland U110 is still the king of string sounds [they use real string samples]. Kurtsweil PC2R is excellent - as is the Triton [a little 'soft'] and the Yamaha Motif [a little too 'Pop']. For some unknown reason when you simply copy and paste the string line, it more than doubles the size of the sound. I have never figured that out. If the synth has the timbrality [Triton has 64 and can be upgraded to 128] then you can use this trick. I use a number of modules [different one for each section] as these tricks simply eat up timbrality. [the U110 will give 32 max] I also use the Korg O5W [excellent strings] and two Akai samplers. With the Triton and Motif. So the answer to your question is that you use a 'section' string sound and simply double it. Usually a string module will present two images of the section to create the stereo image [that is a major benefit of the U110], in effect, you are hearing 4 versions of the sample for each line. Now you can understand how big it can sound towards a normal keyboard player hitting a three note string pad? The only addition, for ultimate realism, is to have the same 1st line played separately by a solo violin sample [this will simulate the idea of the orchestra 'leader'...who sits at the front nearest the main string mics.] It is a good idea to play this separately into the computer with no automatic time correction. So it would be at 1:1624 correction....that is real time, near as dammit. Of course, we are talking here of the full blown orchestral section, which would be useless in a pop arrangement...but then can be wonderful in a Hip Hip ballad or Celine Dion/Ill Divo arrangement. It is good to study and know this stuff so you can use it OR not use it! Copyright © 2001-2006 The Serious Writers Guild. All rights reserved.